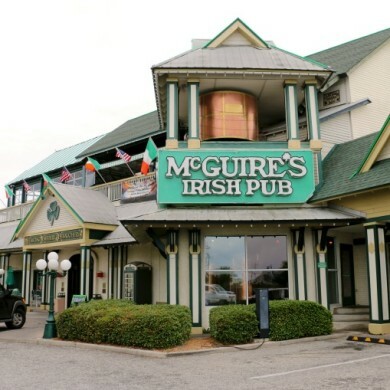 McGuire’s Irish Pub is a Gulf Coast legend. Its Destin location is tucked into a strip of shops just over the pass on the harbor. Most of the stores here belong to McGuire’s – from the gift shop, to the liquor store and wine shop, to the – wait for it – SUSHI RESTAURANT. That’s why you’ll find all of McGuire’s famous brews, paired brilliantly – albeit perhaps unexpectedly – with rolls ranging from your traditional Spicy Tuna to the McGuire’s Roll, handcrafted with Lump Crab Salad, Crab Stik, Cucumber and Avocado, which is deep fried and topped with eel sauce. Just like the original location down Highway 98 in Pensacola, Fla., McGuire’s of Destin brews its own beer on the premises. They’re all brewed in a traditional oak and copper cask, and you can watch the brewers work as you walk to eat your meal. Just pay mind to the “No Chemists Allowed” sign – these recipes are closely guarded. The food is amazing, and the portions are huge. It’s traditional Irish pub fare, which means top-notch steaks, fresh seafood, and something for everyone in your party. There are sandwiches, salads, pastas, and also the ever-popular Irish staples like Shepherd’s Pie and Corned Beef & Cabbage. Don’t get us started on the burgers. You’ll do a double take at some of the cheeky options, like a Skippy Peanut Butter or Terrible Garbage Burger, and even the Grand Burger – served with caviar and champagne, for a cool $100. The steaks are U.S.D.A. Certified Prime. Our personal favorites are the Molly’s Filet (a smaller cut) and the Smoked Prime Rib with a savory au jus. Here’s a full menu that’ll have you dreaming of leprechauns. Be sure to start with the 18 cent Senate Bean Soup. As quoted in the menu, “It’s the same recipe served in the U.S. Senate for 18 cents when we opened in 1977 … the Senate cafeteria has raised the price to $6.oo, but we all know Washington can’t control costs.” However, order it with a meal. If it’s your only purchase, the price jumps to eighteen dollars. Want to see something even funnier? Take a trip to the loo. 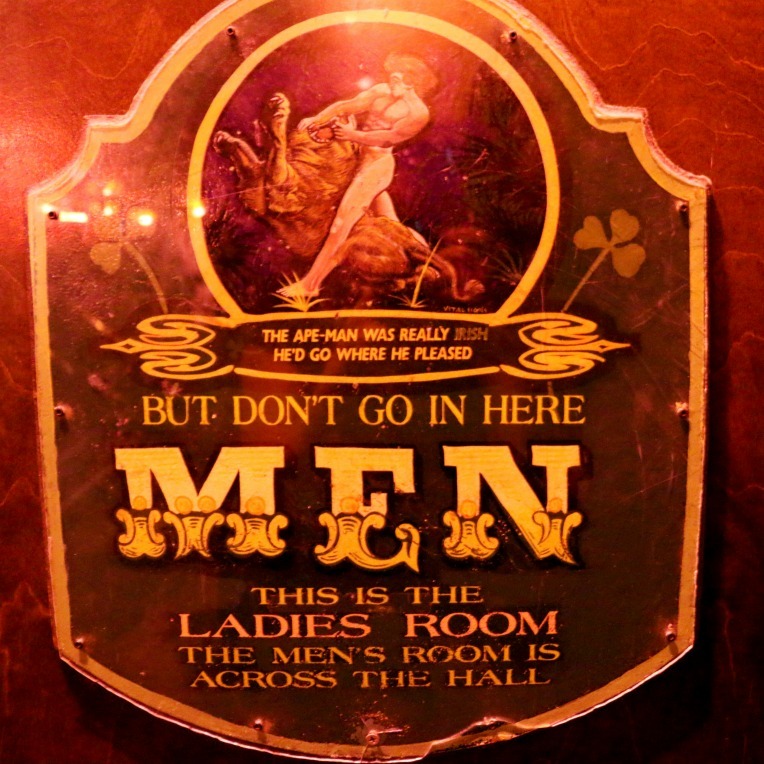 McGuire’s bathrooms have sparked debates about bathrooms since before debating about bathrooms was cool. READ THE SIGNS CAREFULLY, or you may find yourself staring at a very startled man as you exit the stall of the ladies’ room. (Or vice-versa.) It’s just another little bit of tomfoolery we’ll sure you love about this place. Want to make your mark? Just ask your server for a Sharpie and a stapler. Monday – Margarita Madness – $3 beginning at 6 p.m.
Tuesday – Double Shot Martinis All Day & All Night – $3.50 The Biggest Martinis in Town! Wednesday – Mug Club Nite – $2.50 Bar Drinks and $2 Draft Beer for Mug Club Members – 6 p.m. to Close. Thursday – Ask Your Server for Tonight’s Special. Friday – P.O.E.T.S. BLARNEY HOUR – $3 Vodka Drinks 6 p.m. to Close. Saturday – IRISHMEN’S NITE OUT – Bushmill’s Irish Whiskey for only $3 – 6 pm to Close. Sunday – EMORY CHENOWETH NITE – Emory’s $3.50 from 6 p.m. to Close. This is truly a fun place for fun people. Celebrate a special occasion, or make any day feel like one at McGuire’s. McGuire’s of Destin is located at 33 East Highway 98 in Destin FL. For more information, visit the restaurant website or call (850) 650-0000.